"Crushing Low Stakes Poker: How to Make $1,000s Playing Low Stakes Sit ’n Gos, Volume 1: Strategy" is the first of a three-part series by Mike Turner. This book introduces new players to No Limit Texas Hold'em and sets a framework for winning at low stakes Sit 'n Gos, small tournaments which start when a set number of players have registered. The book begins by looking at the fundamentals of Sit 'n Gos, in a way that someone with no poker experience and quickly understand. The game of No Limit Texas Hold'em is described, with explanations of common poker jargon. Next how a Sit 'n Go plays out is covered, followed by essential ideas such as position, ICM and bankroll management. Once the foundation has been set, "Crushing Low Stakes Poker... Volume 1" presents a blueprint on beating these games at low limits. Different stages of a Sit 'n Go are described, with common scenarios included. Strategies for each level are laid out and example hands are provided to demonstrate the point the author is trying to make. The book finishes with advanced advice on how to increase your profits, along with the section on poker tools, which includes tracking software and HUDs. Unfortunately, a lot of the information presented feels dated. This is not to say "Crushing Low Stakes Poker" is bad on the contrary 10 years ago it could have helped you win at high stakes, however poker is an ever-growing game. For a start much of the strategy is based on assumptions of low stakes players, which is not necessarily true nowadays, and some of the tools and sites referenced have since been overtaken by competitors. Even in 2016, the year this book was published low stakes Sit 'n Gos had become less profitable than Turner suggests. In part this is because players have generally become more knowledgeable and certain Sit 'n Go formats have changed, with many games running nowhere near as frequently as they use to. 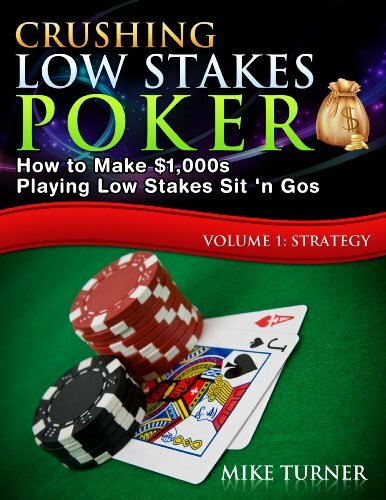 "Crushing Low Stakes Poker... Volume 1 " packs in a lot of information and is ideal for the new player. Everything is explained fully, even topics that were once considered advanced. A lot of the strategy described is sound, and even though much of the information is widely available for free online, new players will definitely benefit from having it all included in one book. While few will realize the promise of serious winnings without doing some extra work of their own, this book does a good job of setting up poker novices on the right path.